If you have to make a baby knit, make these. They are so adorable and tiny! The pattern is fantastic and so quick. I am a really slow knitter and I can't believe how fast I got these done. Well, there are only 30 rows! I have six pregnant friends all of the sudden, so everyone is getting a pair of these. One of them is expecting twins! 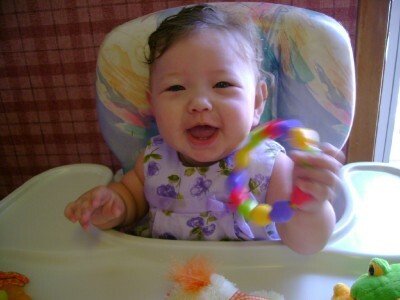 Bella says, "Gramma, you know those little booties aren't going to fit my chunky tootsies!" Chunky baby tootsies are the best! Those booties are sooooo cute. Love your choice of buttons. Those booties do look great. I was looking at that pattern recently, but have no one to knit them for yet. Must say your stole looks good too. I also prefer to knit from a written pattern rather than a chart, although lots of knitters say that once you start knitting from a chart, you'll never go back. Happy knitting. 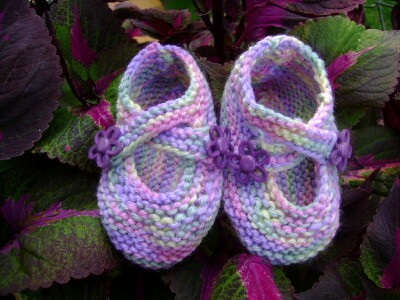 Oh, those baby booties are so sweet! I love them. And congrats on the mystery stole... looks like you're doing just fine! She's such a cutie cakes and those shoes are adorable. Those booties are too cute! I just saw you on Ravelry! I love it! 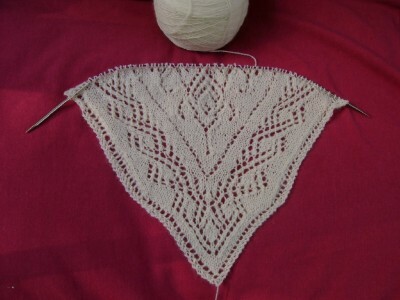 The mystery stole looks gorgeous - I'm about ready to start lace. Yikes! Those booties are so cute! I love the little buttons. The booties are wonderful! I have them on my list of things to make, just haven't done them yet. Great start on the mystery stole!